My husband commenced renovating the night we “moved in” (just a mattress on the floor), ripping up 2 different colors of cheap laminate in the bedrooms. I would have helped him, but I knew that from that point onward, our home would be a dusty construction zone. From there, we would remove more laminate, 400 square feet of tile, 300 feet of dirty pink carpeting, and several walls (NOTE: remove the drywall, but only remove the studs if you are sure the wall isn’t load bearing!). Oh–and all the cabinetry and appliances. If you have the time and a little expertise, handling at least parts of the demolition yourself saves a lot of money that you would otherwise have to pay another professional to handle. Also, it’s gratifying to see the progress you make from day to day! If you are removing load-bearing walls, or making major changes to plumbing and electrical, you may need to obtain permits from your local City Hall. One benefit to doing your renovations with permits is giving reassurance to potential Buyers that your upgrades were done properly, when you decide to re-sell. 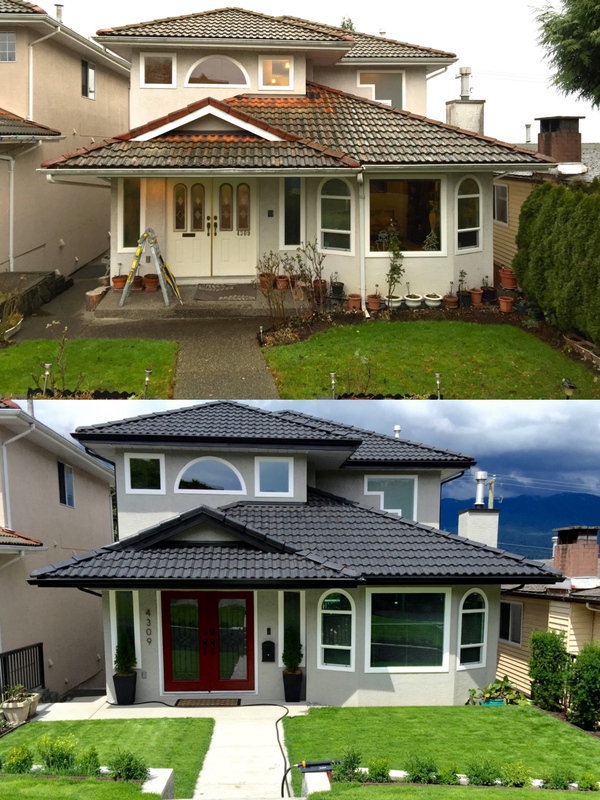 If you plan on renovating your home in stages and on-budget, start by looking at the EXTERIOR of the home—windows, cladding, roof, gutters. While these aren’t “romantic renovations”, upgrading and maintaining these items will protect your investment and pay dividends. With interior renovations, start with the areas where you live and entertain first. Create a living area that you will be proud to live in. As a general rule, kitchen and bathroom renovations can make the most difference, and add the most re-sale value to a home, provided they are done tastefully! Paint is probably the least-expensive upgrade you can make to your home—inside or out. For a timeless look, choose neutral colors. Bright, bold colors can make a statement, but they can look dated after awhile, and you may tire of them. You can always make color statements with accents such as throw cushions, rugs, and other accessories that can be easily changed out. Aside from the walls, paint made a huge difference to the look of our staircase, brick fireplace, front door and hot water baseboards. Our home came with some charming ceiling moldings and a white plaster and marble fireplace, which we intended to keep. In leaving these features, modern kitchen cabinets, for example, would look out of place. We built our vision around the elements in the home that were charming and worth keeping—which is the point of renovating, instead of starting from scratch! Of course, if the home is an all-around dump with no redeeming qualities, then make sure you have a cohesive vision for the entire home—traditional, modern or contemporary. Sometimes, doing something yourself versus hiring a professional can mean the difference between Mickey Mouse and Masterpiece. Know when renovations are outside of your scope of knowledge. Generally, plumbing, electrical and major structural renovations should be left to the experts.